This shop for Grilled Peach Poblano Romaine Salad has been compensated by Collective Bias, Inc. and its advertiser. All opinions are mine alone. 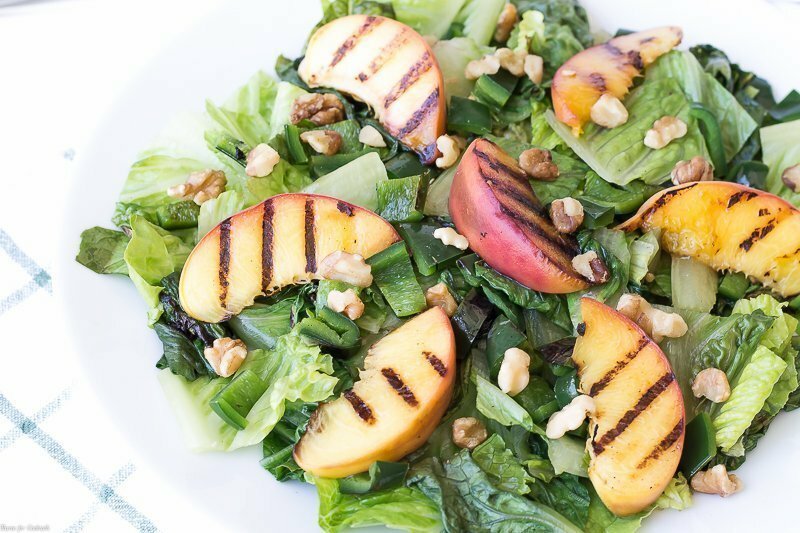 #RealTasteForRealLife #CollectiveBias Give dinner a summertime edge with this Grilled Peach Poblano Romaine Salad. Grilled romain lettuce topped with charred peaches, poblano peppers, walnuts and a Peach Vinaigrette. Do you ever have one of those days where you are so darn busy you aren’t sure if you are coming or going? It feels as if we have been on this uber fast pace for months now. I keep telling myself things will slow down but it never seems to happen. But I know things will change soon… in 54 days when the kid leaves for basic training! 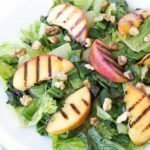 [bctt tweet=”Grilled Peach Poblano Romaine Salad #grilled #peaches #seasonal #salad” username=”thyme4cocktails”] So until then we are packing as much life as possible into each day. Which means there isn’t always a lot of time at the end of the day to get dinner on the table. 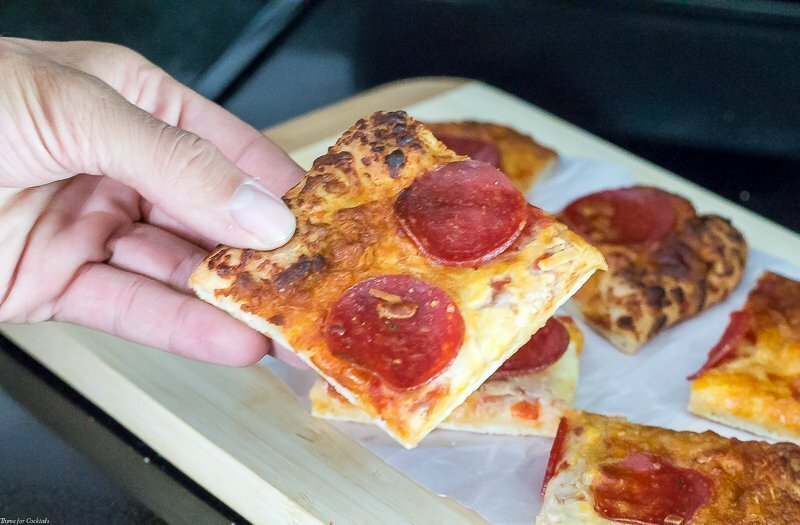 And that’s when we grab our favorite Freschetta Brick Oven Mushroom & Spinach and Freschetta Brick Oven Pepperoni pizzas from Walmart for a delicious, authentic meal. The guys will never turn down pizza night and I will always be the one making a side like this Grilled Peach Poblano Romaine Salad to go with. Funny how that works, isn’t it! 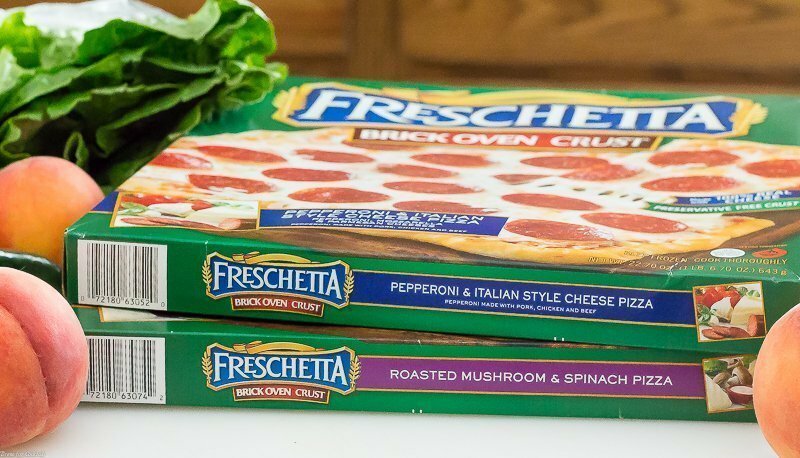 I like that Freschetta pizzas are made with high quality ingredients and have a crust that rises naturally with no chemical leaveners. The great thing about grilled salads is you can make them at any time with the use of a grill pan. 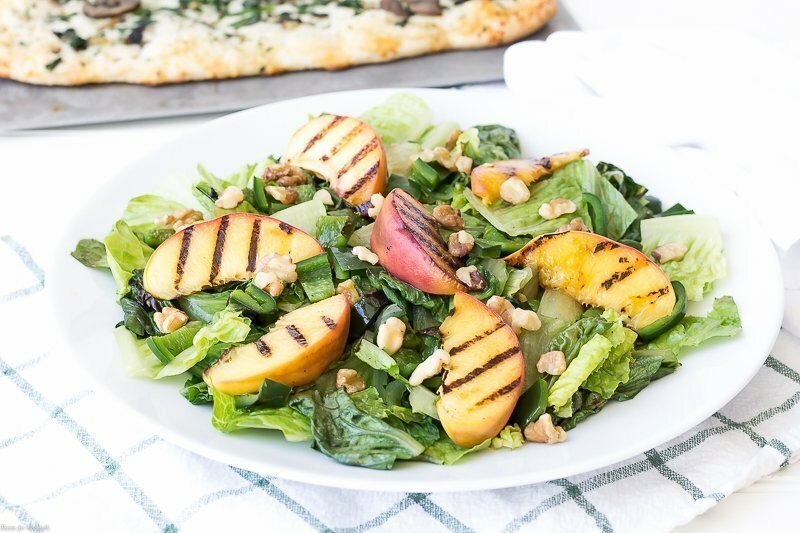 This Grilled Peach Poblano Romaine Salad is easy to make while your Freschetta pizzas cook. 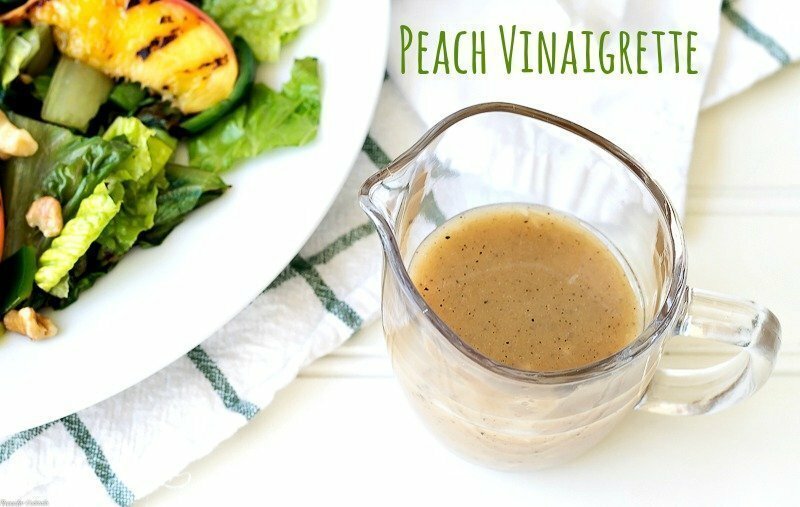 Peaches are in season and we always have peppers on hand so this was an easy salad to make. And I love the smoky flavor your get when you grill romaine lettuce! 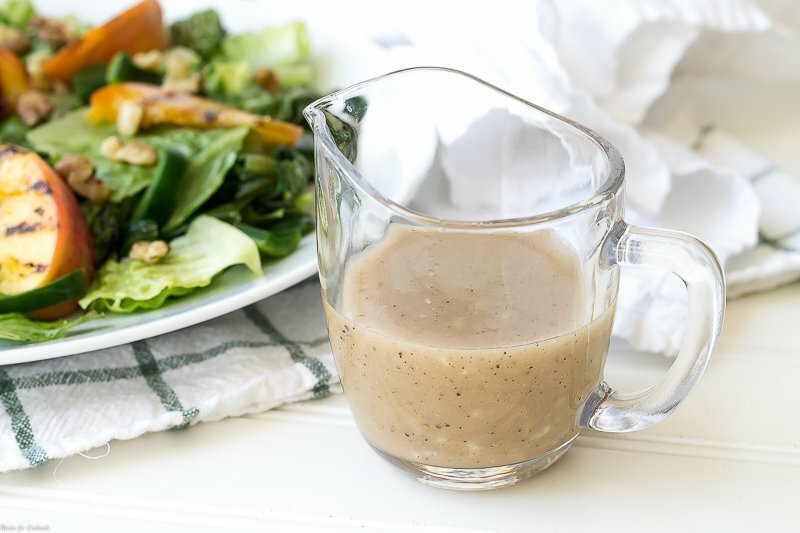 It pairs perfectly with the crunchy walnuts and Peach Vinaigrette in this salad. The kid couldn’t wait for dinner to actually get to the table and just had to sneak a piece of his fave pepperoni pizza. 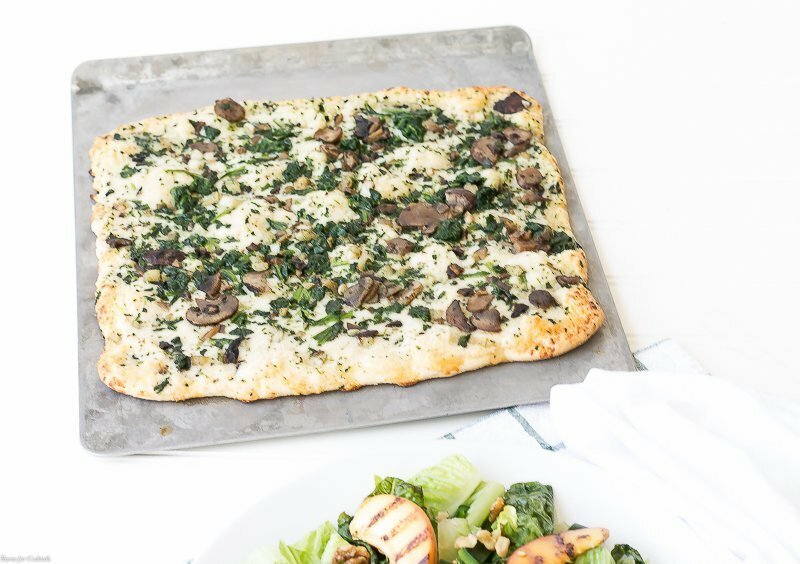 Paul is a big fungi fan so the mushroom and spinach is usually his first pick. And everyone shared the Grilled Peach Poblano Romaine Salad! 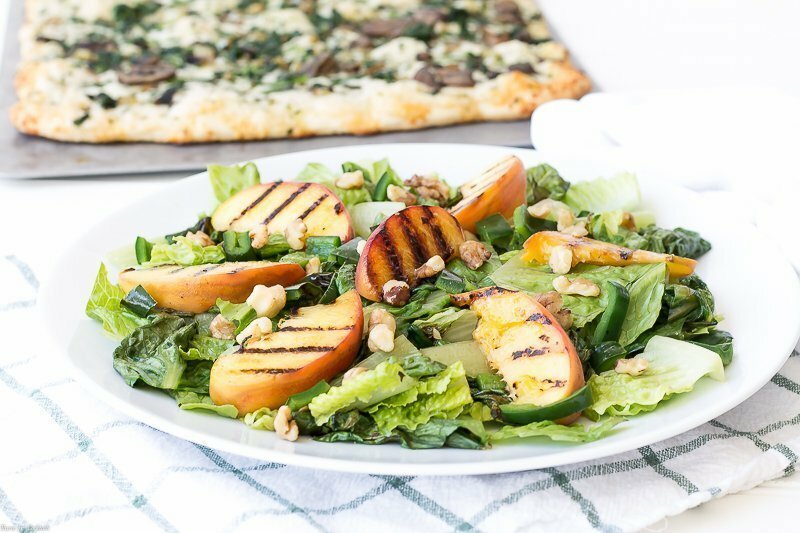 Give dinner a summertime edge with this Grilled Peach Poblano Romaine Salad. Grilled romain lettuce topped with charred peaches, poblano peppers and walnuts. Heat a grill pan over medium heat. Lightly brush with oil. 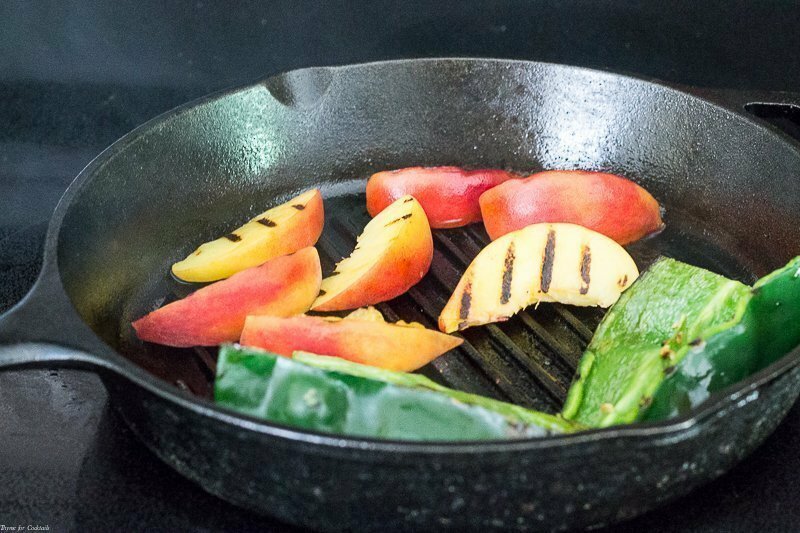 Place peach slices and pepper in pan, cook 2-3 minutes until slightly charred. Set aside on a plate. 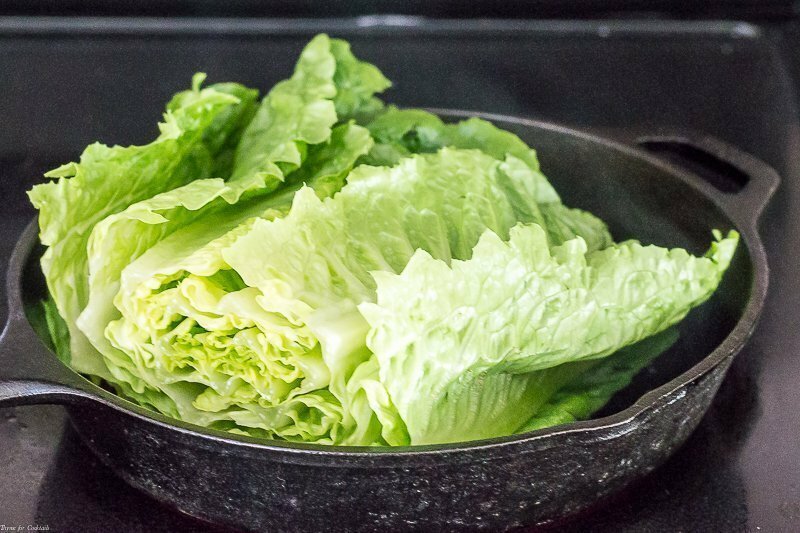 Place lettuce in skillet. Cook 1-2 minutes turning frequently until slightly charred. Roughly chop lettuce and pepper. Toss with peach slices and walnuts. beautiful dish, i love grilled peaches! Gracias! It really brings out the sweetness doesn’t it! Yum what a delicious salad and perfect pairing with that yummy pizza – what a treat!